List reasons to limit access to specific fields. View and edit field-level security settings. Defining field-level security for sensitive fields is the second piece of the security and sharing puzzle, after controlling object-level access. In some cases, you want users to have access to an object, but limit their access to individual fields in that object. Field-level security settings—or field permissions—control whether a user can see, edit, and delete the value for a particular field on an object. These are the settings that allow us to protect sensitive fields such as a candidate's social security number without having to hide the candidate object. Unlike page layouts, which only control the visibility of fields on detail and edit pages, field-level security controls the visibility of fields in any part of the app, including related lists, list views, reports, and search results. In fact, to make absolutely sure that a user can't access a particular field, it's important to use the field-level security page for a given object to restrict access to the field. There are simply no other shortcuts that provide the same level of protection for a particular field. For example, here are some field-level security settings you can set for the Recruiting app. Position object—hide minimum and maximum pay from standard employees and interviewers. Candidate object—hide social security numbers from hiring managers and interviewers. Job Application object—make the Position and Candidate lookup fields read-only for hiring managers. Field settings can be applied either by modifying profiles or permission sets or from the Field Accessibility menu in Setup. Create page layouts to organize the fields on detail and edit pages. Verify users’ access to fields by checking the field accessibility. Customize search layouts to set the fields that display in search results, in lookup dialog search results, and in the key lists on tab home pages. You apply field settings by modifying profiles or permission sets. Let’s try restricting a user's general access with a profile. Then we'll expand it as needed with a permission set. If you haven’t already done it, before you start, enable the enhanced profile user interface. Type User Management Settings in the Quick Find box in Setup, then enable Enhanced Profile User Interface and click Save. Use the Quick Find box to find Profiles in Setup. Select the profile you want to change. "Standard User" will do nicely. Click Object Settings and select the object for which you want to update the field settings. For each field, specify the kind of access you want for users with this profile, and save your settings. Now that you've set field-level security for sensitive data, you can create page layouts to organize the fields for users' convenience, and customize how the fields display in search results and lists. For the final piece of the puzzle, specify the individual records to which each user needs access. By combining security controls at all three levels, you can set up a highly secure data access model which is flexible enough to meet the needs of many different types of users. Let’s look at how field settings can be applied by modifying permission sets. Remember, a permission set is for expanding a user’s access to fields that are restricted in their profile. Let's set up our interviewers to update the candidate record when they've interviewed a candidate. We’ll assume our interviewers have the Standard User profile. We worked with Permission Sets when we set up our custom objects. Now we'll go back to that Setup page to make sure the right fields in one or our objects are available to the users who need them. In Setup, use the Quick Find box to find Permission Sets. Select a permission set and click Object Settings. Click the object you're working with, then click Edit. In this example, we're modifying the Candidate object. Under Field Permissions, specify the kinds of access your interviewers need, then save this permission set. See how we've enabled our interviewers to both read and change the values of the Apex and C# checkboxes? Now they can check or uncheck those boxes when they’ve determined the candidate’s command of those skills. We’ve prevented them from changing the Hire By date or the name of the hiring manager, but they can see that information. And they don’t need to know the pay rate for the position, so we’ve removed both their Read and Edit access for those fields. 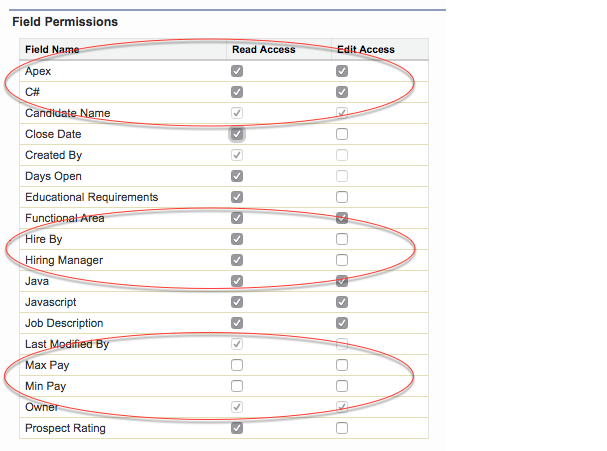 Click Manage Assignments and select the users who you expect to need the permissions you’ve just specified. Click Add Assignments and Done, and you're done! Now you’ve defined field-level security for sensitive data. For the final piece of the puzzle, specify the individual records each user needs access to. By combining security controls at all three levels, you can set up a highly secure data access model that’s flexible enough to meet the needs of many different types of users.